If the poet* spun for half an hour daily, his poetry would gain in richness. T-2-215 (The reference here is to poet Rabindranath Tagore). Charkha, literally meaning “wheel,” is India’s generic term for any spinning wheel or hand-cranked spinning machine. The type of charkha available in the U.S. is more strictly identified as the box charkha. 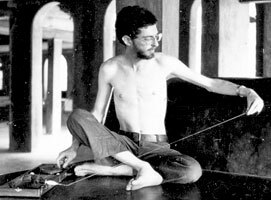 The various models of box charkha have been designed and then manufactured by Gandhi’s co-workers and followers as part of his “khadi movement,” to promote self-sufficiency in cloth-making. The double-wheel drive, which allows greater speed and control as well as portability, is Gandhi’s own innovation. 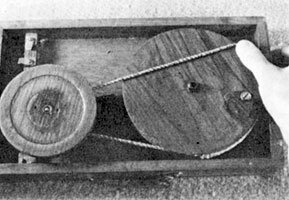 The box charkha was for a long time available in two sizes only: “briefcase” and “book.” The smaller book charkha was more portable but tricker to adjust and use, so the briefcase charkha was usually the best choice. More recently, a medium-sized box charkha has also become available, for a compromise between portability and ease of use. The drive ratio on these charkhas is 125:1. They are normally used to spin yarns between 10 and 20 counts (8,400–16,800 yards per pound). 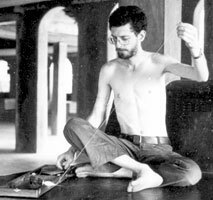 The finest yarns are spun not on the charkha at all, but on a small metal takli (handspindle). The tips given here are for models made in India. American-made charkhas may differ in significant ways. Indians spin their cotton from a compressed, cigar-shaped rolag called a pooni. Tightness and consistency in the pooni is one of the keys to fine and even spinning. You can make your poonis directly from pre-carded cotton, but further carding will improve the texture. In India, the cotton is prepared with a bow, but you can instead use special cotton cards such as sold in the U.S. These are meant to be used with a light touch and minimal loading. Once carded, the cotton should be formed into poonis at once. Lay a thin layer of cotton on a smooth, flat surface. Now roll the layer around a thin, straight stick or dowel. Once all the cotton is around the stick, keep rolling it, pressing down with your hands or a paddle to compress it. To keep your poonis properly compressed, bundle them tightly together with paper wrapped around them, and a rubber band around all. The charkha is a sensitive apparatus, so there’s not much point trying to spin on it before it’s set up correctly! For proper tension, the spindle support post must be positioned far enough forward so that the spindle drive cord holds it vertical—straight up! This gives just the right flex to the metal spring pushing on the post. Also, the post base should be angled so that, when the spindle is spinning freely, its pulley rotates midway between the post arms, not touching either one. The post position is locked by a screw mechanism or a wedge. A common error is to let the post lean over. This is understandable, as there is even a device on each charkha that seems meant for this. On the briefcase charkha, this is commonly a wooden arm in front of the post and swinging toward it. On the book charkha, it is commonly a moveable metal arm on the post itself. Yes, you should move the device into place, but it’s only a guard so the post will not accidentally spring forward and bend your spindle. In normal spinning, the post should never lean on the guard. In the same way, the metal disk on the spindle should not rest against the support post, which would obstruct the spindle’s rotation, lead to tangling at the disk end, and make a lot of noise. To hold the disk away from the post, put a little white glue at one point on the spindle, wrap some yarn a few times around the glued section to form a small mound, then spread a little more glue on top of the windings. With the glue still wet, you should also push the metal disk against the wrapping to fix it in place. Of course, the yarn wrapping must be positioned far enough down the spindle so that it does not itself touch the post and interfere with rotation. But don’t forget the pulley bearing, which must go on before the wrapping is applied! It will either be a long, thin strip of what looks like parchment with a hole at each end, or a leather washer. The parchment-style bearing is positioned against both sides of the pulley. The leather washer goes against the pulley on the spinner’s side. The bearing’s job is to keep the pulley from rubbing directly on the support post, especially while drafting. Spindle bearings are inserted through holes in the post so the spindle will not rotate directly against wood. The Indians make their bearings out of leather or string and then oil them with each use, but those bearings wear through fairly quickly. Following a suggestion by spinning wheel maker Alden Amos, I installed braided strips of dried corn husk, which seem to last forever and also produce less friction, with no oil at all. 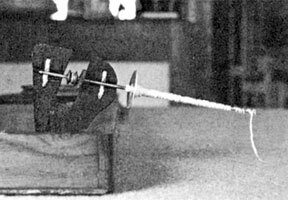 Some U.S. spinners have used charkhas modified to make the spindle horizontal. But this is apparently only to compensate for letting the support post lean over—which is a mistake to begin with. The traditional downward angle of the spindle has been set precisely for greatest speed and comfort of the spinner. The Gandhians install the spindle drive cord to lead from the underside of the spindle pulley to the far side of the small wheel. This turns the spindle counterclockwise as viewed from the tip, for an S twist. Of course, you can choose the opposite direction, as long as you’re consistent. The drive wheels should turn together firmly but easily. If they’re turning hard, the main drive cord is too tight. If the cord slips, it’s too loose. The tension is adjusted by moving the small wheel. This wheel, though, should also be kept as close as possible to the edge of the case on the spinner’s side, so that the spindle can point more directly outward. To move the two wheels far enough apart, you’ll need to first remove the main drive cord, then afterwards put it back on. To remove a tight cord, just shift it off the big wheel rim while turning the wheel. Be careful not to let the cord touch the small wheel’s oiled axle. To put the cord back on, install it first around the metal pulley under the small wheel, again being careful to avoid the oiled axle. Insert the cord only partway around the big wheel rim, then rotate the wheel to bring the cord the rest of the way into place. If you’re able to simply pull the cord into place without turning the wheel, then the fit is too loose. Now and then, you’ll have to replace the spindle drive cord. Before fitting, stretch out your cord to anticipate stretching during spinning. Then fit it to the spindle with the support post positioned as close as possible to the small wheel, again to anticipate stretching. After knotting the cord, cut off the loose ends as close to the knot as you dare and compress the knot against a hard surface. Then coat the cord with beeswax to reduce slipping and to extend the life of the cord. Traditionally, Indians sit cross-legged on the floor for just about everything, so of course that’s what the charkha was designed for. While you might well want to work out a different arrangement, the customary position has its advantages. Here’s how the Gandhians would position things: Both you and the charkha are on the floor. The charkha is to your right and pointing forward, so that the spindle is in front of you and pointing left. With the briefcase charkha, the big wheel is parallel to your hip, so that your right hand falls easily onto it. In this position, it’s simple to hold the charkha steady by using your left foot. With the briefcase charkha, this means resting your foot on the case handle. The book charkha doesn’t have a handle but instead comes with a separate device that looks like an oversize tongue depressor with a piece of bent metal on the end. This metal end is slipped over the edge of the case at a point just next to the big wheel, so that the wooden piece points outward for the spinner’s foot to rest on. If you can’t sit cross-legged, you might want to add non-skid strips to the case, as suggested by spinner Lee Raven. In any case, try to keep the charkha beside you and on the same level as your seat. 1. Draw out the yarn to arm’s length with your left hand while turning the big wheel clockwise with your right. The drafting is done in a continuous motion, at a slight angle to the spindle. The trick is to coordinate the speed of the draw with the speed of wheel turning, so that the yarn holds together but not too much twist travels up into the cotton in your hand. 2. Keeping the yarn taut, lift your hand. Unwind yarn from the spindle tip while turning the wheel counterclockwise. 3. Still keeping the yarn taut, turn the wheel clockwise to wind the yarn tightly onto the spindle. Finish by winding yarn loosely down to the tip while moving your hand back to drafting position. A good spinner can complete this cycle in just a few seconds! 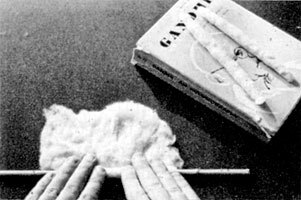 With cotton, joining requires a different touch than is used for wool. Here’s how to join the pooni to a starting length on the charkha spindle—or to reconnect the pooni following a yarn break. Hold the pooni lightly in your left hand, with your palm diagonally upward. The yarn to be joined should extend about one foot or more from the spindle for easier, smoother joining. Lay the last several inches of the yarn on top of the pooni and hold it there lightly with your thumb. Most problems with joining the pooni result from too heavy a touch with the thumb. Now start turning the wheel, and at the same time pull the pooni slowly away from the spindle so that the yarn slides out from under your thumb. Just as the tip of the yarn escapes from under your thumb, it should contact the fibers at the tip of the pooni and mesh with them. Continue drawing back the pooni—and you’re spinning! For the beginner, probably the easiest method of drafting the yarn is to draw it out to arm’s length with incomplete twist, then pinch the yarn at the pooni tip and add final twist to strengthen it. About three extra turns of the wheel should do it, and you’ll feel the yarn shorten. But before this final strengthening, be sure to draw out any thicker, looser portions of the yarn by pulling carefully and adding a little twist as needed. Evenness is crucial with cotton, because thick sections can still be weak enough to pull apart even as a thin section snaps from overtwist. Though this method works well enough for a beginner—and it’s the only one I’ve managed myself—my teacher called it “unscientific” and strongly objected to it. 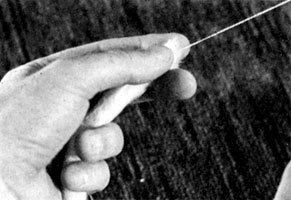 Using a tight, consistent pooni, he drew out a consistent yarn already at its final twist, relying on the clicking of the yarn against the spindle tip to tell him that this twist was being achieved. At the end of the draw, he wound the yarn onto the spindle without further strengthening. This yarn, if sized, could be used for warp without plying. Only the first inch of the spindle is needed for the spiral that holds the yarn in place when drafting. When winding the drafted yarn, the Indians start at this distance from the tip, wind the yarn in a tight spiral toward the metal disk, then back again to the starting point, just once. A continuation of this motion puts a slightly looser spiral onto the last inch in order to resume drafting. The shape of the cop is not a cone, which would hold less yarn, but something like a top. You should be able to fit about 100 yards of relatively thick yarn on the spindle. Of course, there is no one who will make you use the charkha the way the Gandhians intended. But if you try their methods, developed and refined over decades, you’re likely to be rewarded with a more enjoyable experience, as well as higher-quality yarn. Posted on February 5, 2018 by admin. This entry was posted in Gandhiji, Truth. Bookmark the permalink.